Walking with Jesus: Day 195: John 19:17-27 & Psalm 82 - Why Was "King of the Jews" Written on Jesus' Cross? 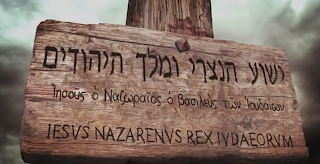 Day 195: John 19:17-27 & Psalm 82 - Why Was "King of the Jews" Written on Jesus' Cross? Why Was "King of the Jews" Written on Jesus' Cross? Pontius Pilate washed his hands of Jesus. He declared Him innocent of treason and rebellion and said very clearly, "I find no guilt in him." (v. 6) Yet, cowardly, he decided to pacify the Jewish leadership and give them what they wanted - the death of Jesus. Interestingly, once Pilate decides to give in to their demands, he then starts consistently referring to Jesus as the King of the Jews. When he presents Jesus to the crowd one final time, he says, “Behold your King!” He then asks them, “Shall I crucify your King?” To this question, the chief priests, of all people, answered, “We have no king but Caesar.” In the end, when Jesus was hung on the cross, Pilate ordered an inscription be put on the cross reading, "Jesus of Nazareth, King of the Jews." So, what was Pilate thinking? Why did He do this? Did he suddenly change his mind and think Jesus was trying to lead a Jewish uprising against Rome? No, it doesn't seem like he did. Rather, it seems like Pilate was trying to lay the blame for Jesus' death at the feet of the Jews, while at the same time mocking them for having their king crucified. But there's a more important reason why "King of the Jews" was written on the cross: Because it was true and God wanted it proclaimed there. Jesus was the promised Messiah, the Son of David. He was the King of the Jews. And yet, the sign was written in Aramaic, Latin and Greek, all of the major languages of the people and of the empire. This was to signify that Jesus' kingship had worldwide significance. Jesus was not just the King of the Jews, but He hung on the cross as the King of the Jews. He hung on the cross to pay for the sins of God's people as their King, dying in their place. Part of what qualified Him to hang on the cross in the place of God's people was His position as their King. And yet, He was not just hanging there for the sins of His Jewish people; He was paying for the sins of all of God's people, from every tribe, tongue, people and nation. So the sign was specific to His office but universal in its proclamation. Is Jesus your King? Did He hang there for your sins? Will you adore Him at the foot of that shameful and yet glorious cross?